One of the key features of the Horizon Cloud Pod Architecture is the high availability and scale-out of virtual desktops in VMware Horizon 6. Many of you may have heard about this feature referred to as Linked-Mode View or Multi-Data-Center View or Federated View Pods. All of these mean the same thing. Today, virtual desktops provided by Horizon can be deployed using a block and pod architecture, or design. (Refer to sections titled View Building Blocks and View Pods in the View Architecture Planning Guide.) A single View pod can contain up to five View blocks, can scale up to 10,000 (10K) desktops, and can be deployed in a single data center. Customers looking to scale beyond 10K desktops can deploy multiple View pods. However, each View pod is an independent entity that has its own user entitlements and is managed separately. With the new Horizon 6 Cloud Pod Architecture, customers can aggregate multiple View pods in either the same data center or different data centers and entitle users to a desktop in any location. Support for active-active deployments – Customers who have multiple data centers can now leverage all the data-center assets efficiently. They can entitle users to desktops either in one or in multiple data centers. Consolidation of multiple pods within a single data center – Multiple pods of desktops within the same data center can be consolidated and managed centrally through a single global user-entitlement layer. Disaster recovery – The global user-entitlement layer can be used to assign a user to desktops in both Pod 1 and Pod 2. If Pod 1 were to become unavailable either due to a data-center failure or to another form of failure, the user could always get to a desktop in Pod 2. It is important to note that this feature assumes that the desktops in Pod 1 and Pod 2 are replicated using some form of data-replication technology. 1. The end user enters the URL or IP address for their View environment, which can be an address of a View Connection Server (broker) or a load balancer, and enters their credentials. 2. The broker looks up both local and global entitlements for the user. 3. The broker gets the current desktop state via inter-pod protocol and returns a list of desktops to the client. 4. The user selects a desktop. 5. If the desktop is remote, the broker launches the remote desktop via inter-pod protocol. 6. The client connects to the remote desktop directly or via a local tunnel. Global roaming desktop – This is a use case where the end user needs access to a desktop only to access their Windows-based applications. An end user can be located either in India or the U.S. with an entitlement to a nonpersistent desktop pool. The end user gets a desktop in their connected pod (that is, close to their client location—If they connect from India, they get a desktop in India). Global home desktop – This is the typical case where the end user wants to get the same persistent desktop every time they request access, irrespective of their location. To accomplish this, persistent desktop pools in all pods need to be set up. The FromHome policy can be used to direct the user back to their home site. The end user gets the same desktop machine irrespective of which pod they are connected to. Local scale desktop – In this use case, each site has multiple pods, each offering a standard nonpersistent desktop pool. A global entitlement layer provided by Cloud Pod Architecture joins all these pools together. Using the site’s Scope policy, one can control and limit access to a desktop that is available within the site. Scope – Controls the scope of search when placing a new desktop session. This allows the administrator to control the amount of cross-data-center traffic. FromHome (true/false) – This controls where the desktop search is started. When false, it starts from the current pod; when true, it starts from the user’s home site. The search order favors local resources, starting in the same pod that the user connected to, then extending to the same site, and then across the entire linked environment. In addition to this default search order, administrators can nominate a home site for a single user or for a group of users. When a global entitlement has the FromHome policy set, the search for a new desktop is started in the user’s home site and not the current connected pod. This ensures that, where needed, the desktop session remains close to any backend resources it needs. This scale is just the beginning, and the team at VMware is committed to increasing these numbers over the next few releases. WAN links between data centers are sufficiently provisioned and have good latency characteristics—however, the feature works on low-bandwidth, high-latency connections and does not impose either a latency drag or additional bandwidth. It is important to note that user experience varies with both the latency and the bandwidth between data centers. As you can see, the Horizon Cloud Pod Architecture further advances end-user mobility by delivering desktops from any data center in any geographic location. This is just the beginning of the journey to the hybrid DaaS era! By Warren Ponder, Director of Product Management, End-User Computing, VMware and Pat Lee, Director of End-User Clients, End-User Computing, VMwareToday, I am really excited to share another exciting project I was to be asked to support our team in delivering, with the announcement of Horizon 6. One of the many new capabilities that will be available is application remoting of RDS hosted apps and extended capabilities for RDS based desktops. There’s been some speculation and many experts have had some really good questions about how, what and why we are doing this so I wanted to provide some color to many of the questions I know people have. Several factors came into play in our decision but the primary factor was customer demand. We spent a lot of time with customers across the globe that included all sizes, levels of expertise, and stages of their journey toward a mobile-cloud vision. We didn’t focus on what we already knew about application remoting, but how customers were actually using app remoting today – what they like, don’t like, and the role they see it playing in the future. We wanted to make sure we understood how their needs around app remoting had evolved so we could introduce the appropriate improvements. With the increase of mobile devices and cloud services, the mobile-cloud era is upon us. It’s changing the landscape. More than ever customers are looking for simplicity and converged infrastructure. They look to VMware as a strategic partner to deliver SDDC and EUC capabilities supporting their Hybrid Cloud efforts. Working closely with customers it was made clear to us that delivering a single platform that converges virtual desktops, RDS hosted apps, SaaS apps, virtualized ThinApps and even third party solutions such as Citrix XenApp is what customers needed to be successful. This all needs to be possible though a unified workspace that gives their users one place to go for access and consumption. This is the only proper, supported, way to integrate with Microsoft RDS. Although it’s not an easy undertaking, it provides several benefits. Windows OS and other capabilities unique to RDSH like fair share CPU scheduling, or IP virtualization are all supported. Applications that need session level information, leveraging WTS API’s all work without ISV’s having to do anything special or unfamiliar. Administrators familiar with managing or designing RDSH based desktop or app remoting solutions will feel right at home. A key component of remoting apps is seamless windows. This is the ability to remote one or more applications to the user. Applications should have the behavior and experience of running locally. Two of our personal desktop products, Fusion and Workstation have provided a similar feature for years called Unity. Unity seamlessly integrates applications running in a local VM with the host operating system. Building upon this, we extended it to remotely display applications across networks. Today, we bring all of our experience making Windows apps run well on multiple platforms with Horizon 6 and deliver an amazing Windows remote application experience for Windows, Mac, iOS and Android users. From Windows XP SP3 to Windows 8.1 Update 1, the Windows client delivers a great remote application experience for Windows users. With individual applications that have seamless windows in the task bar, jumplist integration and favorites, and the ability to save desktop shortcuts for apps and desktops, the Windows client makes it’s easy to get to your apps and desktops when you want them. On iOS and Android, swipe to bring up the intuitive sidebar to switch between open application windows, close a specific open window or application, or easily open a new application. Integration with VMware View is seamless and strait forward. Customers can upgrade existing environments and instantly have the ability to remote RDSH hosted desktops or apps. The only thing needed is the RDSH servers. View provides ability to create farms, which are groups of RDSH servers hosting apps or desktops. Within View, app pools are created and used to organize application entitlement for users or groups. App Pools can be created automatically using applications discovered across farms. Unique apps that are not registered or started using scripts can also be created manually. Apps can mixed with hosts serving RDSH desktops. Apps can come from multiple farms and a user can also access multiple apps simultaneously. Users will be able to access their RDS hosted apps or desktops using devices from our broad ecosystem of device partners and the Horizon Client for Windows, Mac, iOS or Android. A client for Linux will also be available soon. A unified workspace is possible though Horizon Workspace integration. Users can access their SaaS, ThinApps, RDS hosted apps, even apps from Citrix XenApp from one, unified workspace that provides a consistent experience across any device. Need some management? The vCenter Operations team has expanded vCenter operations to include support for RDSH hosts, including integration with PCoIP stats monitoring on a per session basis from RDSH. In support of our hybrid cloud delivery, all components of Horizon 6 have been built with a focus on flexibility to ensure that customers can choose on-premise or off-premise or both to deliver a common and consistent experience to their end users from a single Horizon client. As you can see, a lot of work went into adding this capability to Horizon 6 but we truly believe customers will find that our unified approach and support for all types of applications and desktops can save them time, money and spare them a lot of headaches. New – Citrix XenApp 7.5 and Citrix XenDesktop 7.5 Visio Stencils! One of the most common things every design document has is a conceptual diagram showing how the entire solution fits together. Citrix XenApp 7.5 and Citrix XenDesktop 7.5 is no different. 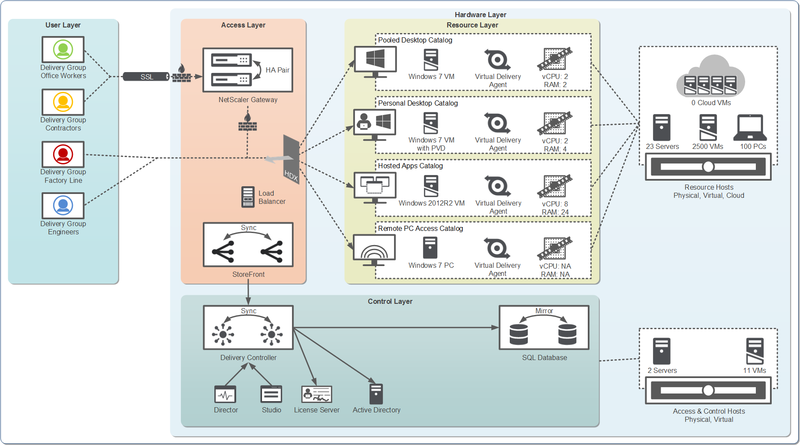 If you looked at the XenApp 7.5 and XenDesktop 7.5 blueprint blog, you would have seen a new conceptual diagram based on the Citrix 5-layer model (Users, Access, Resources, Control and Hardware). The good news is that I’ve put all of these images into a new Microsoft Visio stencil. But it gets better!!! Daniel Feller – Lead Architect receives a lot of emails from Citrix architects and admins who want the Visio diagram in addition to the stencil. Daniel end up sending these out because it saves many of you a lot of time so you don’t have to recreate the wheel (I mean diagram). So Daniel started to think about how I can make the diagram available to everyone as well. Eureka! So when you download the Visio stencil, the first two items will be the Conceptual and Detailed Architecture diagrams. VMware Horizon DaaS built on vCloud Hybrid Service Now Available. VMware announce the availability of VMware Horizon DaaS, built on vCloud Hybrid Service. VMware Horizon DaaS provides Windows desktops and applications as a cloud service, to any device, anywhere, with a predictable monthly subscription. The demand for cloud-hosted virtual desktops has reached a tipping point. We’re seeing a variety of factors contribute to this demand. End users are more diverse than ever before and they want to work from anywhere, on any device. IT is under a ton of pressure to enable this diverse, mobile workforce to get work done and that means being able to access corporate data, applications and resources. It’s now IT’s job to balance these requirements with security, operational simplicity and at the same time control cost. Virtual desktops have emerged as a great solution as they enable desktops to be centrally located, yet accessed from anywhere on any device. Yet for many customers, on-premise virtual desktop infrastructure does not meet their needs. They may not have the upfront capital to get up and running, or the IT skills to deploy and operate the infrastructure. Or they lack the agility to get from zero to desktop in days versus months. That’s where Horizon DaaS comes in. Horizon DaaS enables IT to move towards an OPEX model that eliminates capital outlay and enables them to pay only for what they use. Since VMware provides the support and management of the underlying DaaS infrastructure, minimal expertise is required. And with a cloud service, you gain the flexibility to scale up/down as business needs change. Adaptive end-user experience – Through the power of Horizon View Client and Blast, Horizon DaaS provides a premium experience that adapts to changing network conditions. And we support access from any device, whether it be a zero client, thin client, PC, Mac, tablet, phone or even from a browser or Google Chromebook. And we make it easy to access Windows desktops from a mobile device with features such as gestures and easy access to frequently used files and applications. It’s the reason why Gartner recently recognized Horizon View Client for delivering a great experience from any device, anywhere. Full Windows Client virtual desktops – Although Horizon DaaS provides Windows Server hosted desktops like other vendors in the marketplace; our experience has told us that customers prefer full Windows Client virtual desktop. With Windows Client desktops on Horizon DaaS we can provide the end-user experience, application compatibility, and security that enterprises require. Built for the cloud from the ground up – While other vendors have tried to stitch their on-premise VDI products together, put them in the cloud and call them DaaS, Horizon DaaS was built for cloud from the get go. It’s built on a multi-tenant grid architecture that was designed for cloud-scale. Enterprise-grade service, support, and SLA – Feedback from our customers is clear: they expect enterprise-grade service and they want to know that when they have an issue they can get someone on the phone to help them 24×7. With VMware Horizon DaaS you gain access to the proven expertise of specialists that know how to run cloud-hosted desktops at scale with integrated 24×7 phone support and a 99.9% SLA. And with VMware, customers get access to the only vendor that can deliver hybrid DaaS: on-premise and cloud-hosted virtual desktops. IT gets greater flexibility to choose the option that works best for them, while providing end users a single client that spans any cloud. VMware encourage you to learn more and sign up for a free trial at www.vmware.com/go/daas and join us for a webinar on 3/20 to learn more. step-by-step instructions on how to build the solution. desktop virtualization solution with multiple delivery models that is optimized for flexibility and cost-efficiency. considerations, and step-by-step instructions about how to perform specific tasks. Infrastructure built on IBM Flex System running Citrix XenDesktop.